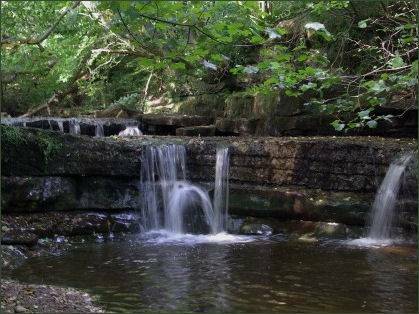 Spectacular How Stean Gorge, known as England's little Switzerland is situated in the Nidderdale Area of Outstanding Natural Beauty and makes an action packed day out for all the family. 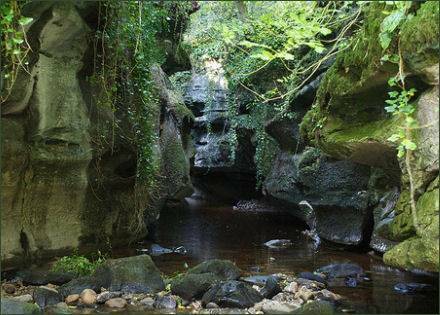 The limestone ravine has been carved out by water over thousands of years, the steep sided gorge is almost 1 km (just over ½ a mile) in length and up to 20 metres (80 feet) deep in places. Visitors can explore its caves and tunnels or take part in a number of outdoor activities such as gorge walking, abseiling, caving, canoeing, and rock climbing. How Stean Gorge's Via Ferrata course is an aerial network of beams, ladders and cables. The gorge is geographically unique, and is one of the only places in the England where both rocksports and paddlesports are available in a single day. A cave in the gorge was once the hideout of a notorious highwayman named Tom Taylor, who is said to have killed many of his victims in cold blood . The cave leads off the side of How Stean Gorge and emerges in a nearby field. Local legend relates that he hid in the cave and when he overheard people approaching he would make a sound like the hoot of an owl. Searchers then concluded that the cave must be empty if an owl was in it. However, after being involved in a fracas, Taylor lost some of his front teeth, resulting in the subsequent 'hoot' sounding nothing like an owl. He was eventually apprehended, tried and executed.